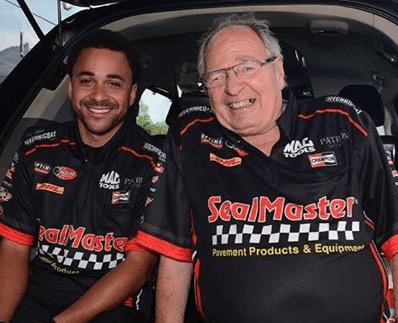 SealMaster and Kalitta Motorsports are pleased to announce SealMaster will become the primary sponsor of the Top Fuel dragster driven by J.R. Todd for the entire 2016 NHRA Mello Yello Series. “After having top-notch experiences with Kalitta Motorsports, the NHRA and their fans for the past two years, we decided to take our partnership to a more prominent level in 2016,” says Rick Simon, director of franchise operations. “J.R. Todd is a great driver and stand-up guy. He represented us in a SealMaster Top Fuel Dragster in Norwalk and Denver last year and the exposure our brand received for both events was quite eye-opening,” he adds. “Our involvement with Kalitta Motorsports and the NHRA gives us a great national platform to share who we are and what we do: We’re the one-stop source for pavement maintenance supplies and equipment,” Simon adds. SealMaster will also have a role in the remainder of Team Kalitta’s entries as it returns to sponsor Doug Kalitta’s Mac Tools Top Fuel Dragster for the third season, while adding 2015 NHRA Mello Yello Funny Car Champion Del Worsham’s DHL Toyota Camry Funny Car and Alexis DeJoria’s Tequila Patrón XO Café Incendio Toyota Camry Funny Car to their sponsorship portfolio. SealMaster will also continue its partnership with the NHRA sponsoring the SealMaster Track Walk every race weekend. Fans will have the opportunity to meet Team Kalitta personalities all season as they walk the surface drivers will race on just hours before the race action. In addition, SealMaster’s popular display dragster, the SealMonster, will also make several appearances on the 2016 NHRA Mello Yello Season.Those attending the National Pavement Expo later this month will have the opportunity to meet J.R. Todd between 1:30 and 3:30 p.m. on January 28 at the Charlotte Convention Center at SealMaster Booth #339. Additionally, the SealMaster Top Fuel Dragster will be on display in the exhibit hall. Those attending the National Pavement Expo later this month will have the opportunity to meet J.R. Todd between 1:30 and 3:30 p.m. on January 28 at the Charlotte Convention Center at SealMaster Booth #339. Additionally, the SealMaster Top Fuel Dragster will be on display in the exhibit hall. SealMaster franchisees manufacture pavement sealer and distribute a full line of pavement maintenance products and equipment throughout the United States, including Puerto Rico. Franchisees serve contractors, public and private road maintenance departments, property managers and others charged with pavement maintenance and preservation. The company’s products and equipment are sold in every state where the NHRA Mello Yello Series races. For more information about SealMaster, including franchise opportunities, visit sealmas-ter.net or call 800-341-7325. Based in Ypsilanti, Mich., Kalitta Motorsports is a Top Fuel and Funny Car drag racing team in the NHRA (National Hot Rod Association) Mello Yello Drag Racing Series. The team was founded and is owned by drag racing icon Connie “the Bounty Hunter” Kalitta. For more than 50 years, Connie has been involved in the sport as a driver, tuner, and an owner. Kalitta Motor-sports is one of the most successful teams in the history of auto racing with six world champion-ships and over 100 national event titles in five different professional drag racing sanctioning bodies since it was established by Connie in 1959.